What does successful adaptation look like? This is a question to whichplanners, policy makers and other professionals charged with the task of developing and implementing adaptation strategies need urgent answers. There is no clear guidance as to what success would look like, what to aim for and how to judge progress. To begin answering this question, I have co-edited a book with Max Boykoff that tries to provide both scientifically informed and practice-relevant answers from various sectors and regions of the world. It brings together leading experts within the field to present careful analyses of different cases and situations, questioning throughout commonly avowed truisms and unspoken assumptions that have pervaded climate adaptation science and practice to date. It identifies the various dimensions of success, explores the tensions between them, and compiles encouraging evidence that resolutions can be found. 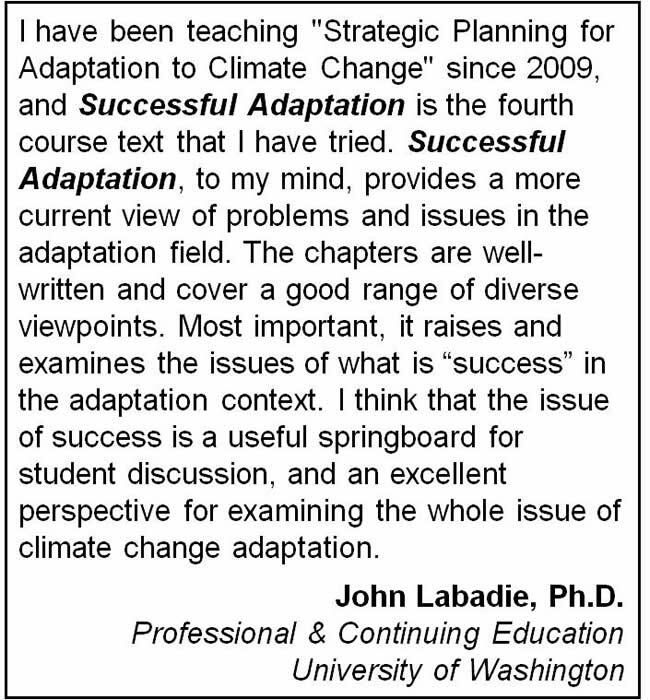 It appraises how climatic and non-climatic stressors play a role, what role science does and can play in adaptation decision-making, and how trade-offs and other concerns and priorities shape adaptation planning and implementation on the ground. You can read a book review here and find related publications here.